1940: Valery Averianov (Guru Var Avera), a creator and a leader of the movement, was born. Early 1960s: Averianov, at the time a student at Leningrad State University, developed interest in Eastern spirituality. 1962: Averianov was expelled from the university for “anti-Soviet propaganda” and moved to Buryatia, a historically Buddhist region of the USSR, where he spent 1963 – 1964. Mid 1960s: Averianov moved to Moscow and met a man whom he later called his spiritual teacher, a freemason and a university professor, Alexander Markov. 1969–1970s: Averianov published as samizdat his first texts about yoga and subtle energies. At some point during this period he created a group of followers called the Aharata School. Circa 1974: Averianov mentioned the necessity of creating an original Russian system of spiritual training and martial arts analogous to Japanese martial arts. Early 1980s: The unofficial samizdat publication of a foundational text Astral’noye Karate (Astral Karate) that described main practices and doctrines of the movement took place. The creator of Aharata School that promoted a practice of astral karate was a Soviet spiritual teacher Valery Averianov, [Image at right] also known as guru Var Avera. In early 1960s, when Averianov was a student at Leningrad University, he developed an interest to Eastern spirituality and attended lectures about Buddhism. This interest lead to accusations of participation in anti-Soviet propaganda that resulted in his expulsion from the Communist Party and the university in 1962. Although details of his years in the university remain unclear, Averianov mentioned on several occasions a Soviet spiritual leader Bidia Dandaron (1914–1974). Dandaron was a Buddhist teacher who between 1956 and 1972 was a lecturer in Indology and Tibetology at Leningrad University (Menzel 2012:175). It seems very likely that Averianov, who was a student at the same university, became interested in Eastern spirituality thanks to Dandaron’s followers who, after Averianov’s expulsion from the university, recommended that he move to Buryatia, a historically Buddhist region of the USSR located in Siberia. According to Averianov, his move to Buryatia was spiritually significant. Tibetan Buddhism of Gelug school, that had existed in these regions for centuries, developed a wide array of esoteric practices that Averianov claimed to have learned during his life in Buryatia. These claims, although exaggerated, might have some basis. While it is hard to imagine that during his relatively brief stay in Buryatia he studied esoteric doctrines of Gelug tradition in depth, it is evident that he familiarized himself with local spiritual traditions. 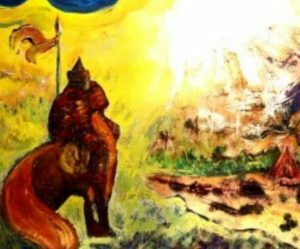 Among other things, he produced a series of paintings dedicated to Geser, [Image at right] a legendary warrior, magician, and king from Central Asian mythology. Nicholas Roerich (1874–1947) promoted images of Geser in his works, and Averianov later mentioned Roerich’s texts as a source that informed his interests during this period (Var Avera 2003:31). Later on, the image of a warrior-magician will appear on many occasions in Averianov’s lectures and writings; however, during this period he also became increasingly disenchanted in Dandaron’s followers and Eastern spirituality in general (Var Avera 2003:31-32). The reason for that, according to Averianov, was his experience of facing Buryatian nationalism (Var Avera 2003:32-34). In mid-1960s, Averianov moved to Moscow and plunged into the local esoteric underground. He claims that during this period he met his spiritual teacher, Alexander Prokophievich Markov (1885/1886–1973), who was an economist and a freemason. Markov spent almost thirty years living in Europe, but by the 1960s he had returned to the Soviet Union and worked as a university professor in Moscow (Panin 2017:414). Averianov could have met him after his return from Buryatia wandering through different esoteric groups. To what measure they actually had teacher-student relationships remains unclear; nevertheless, it is possible that influence by Markov amplified Averianov’s worldview through ideas of esoteric Christianity and provided a feeling of connection with prerevolutionary Russian culture. Substantiating Markov’s influence, Averianov would later call astral karate “a school of Russian freemasons” (Var Avera 2009). “since the Thaw, there was a marked reaction against the atheistic practice and everyday life. In the late 1960s and 1970s charismatic individuals, numerous mystical circles and sects emerged in the two capitals and in cities throughout the country” (Menzel 2012:151). Averianov, therefore, was a part of this new wave of spiritual seekers. In his early texts, published unofficially as samizdat, he wrote about yogic exercises and a psychic energy called “sansa.” To master the control of sansa, students ought to complete a special training, such as meditations and breathing exercises. Although the term “astral karate” does not appear in early publications, ideas and practices described there would later constitute a core of Aharata School. Unfortunately, Russian sport system does not include any principles of meditation and has no clear egregor. Effects of Hatha Yoga are not available for it. In Japan school of martial arts, judo, karate, are schools of meditation. We may try to create something like this here (Var Avera 1974). A result of realization of this plan was the formation of Averianov’s circle of followers that he called Aharata School. The precise date of creation of Aharata School and the book Astral’noye Karate (Astral Karate), a foundational text of the movement, is unknown. However, it is the most likely that the text appeared between 1980 and 1983, and the Aharata School appeared several years prior to the book. The movement became a well-known and influential, yet controversial, branch of late Soviet esotericism. In 1996, Igor Kungurtsev and Olga Luchakova described it in the following manner. …the school of Averianov (known under the pseudonym ‘Var Avera’) in Moscow is concerned with the purity of the astral plane and practices ‘astral karate’ to keep away evil sorcerers and entities. These activities, of course, were not taken seriously in mystical circles. The group was nicknamed ‘the Astral Police,’ while the guru himself received the title of ‘Astral Colonel’” (Kungurtsev and Luchakova 1996:27). With the liberalization of Soviet life during Perestroika, the movement gradually became more visible. An abridged edition of the core content of the Astral’noye Karate book appeared in print semi-officially in 1992 without the name of its author, followed by several full-fledged editions during the 1990s and 2000s. 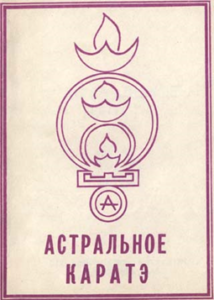 Although Aharata School itself never transformed into a well-established institutional structure, it influenced many spiritual movements in post-Soviet countries, specifically those related to martial arts, yoga, and Slavic Neopaganism. Averianov covered a vast range of topics in his lectures and publications. His doctrine, although in general coherent, does not appear in a systematic form in any single publication. Averianov’s doctrine incorporates elements of both Western and Eastern spirituality. It relies on different sources, such as esoteric Buddhism, yoga, Blavatsky’s theosophy, and Roerich movement. In other words, Averianov utilized most of the sources available in Soviet esoteric underground and combined them into his teaching. Russia, Europe, and Baltic states, need their own, clearly national Schools of Karate to annihilate Chinese aggression and to stop sucking of energy from white race to yellow. And we should spread our methods worldwide so that the world feeds not China and Japan, but us, Indo-Europeans, which is objectively better to the world, because an expansion of European culture is preferable for humanity than worldwide Chinese ‘Cultural Revolution’ (Var Avera 2003:29-30). Thus, Western students should learn non-Western spiritual technics, but adapt them to their own needs and westernize them. In this process Russia plays a central role as Europe’s Eastern frontier and a place where contact between Western and Eastern civilizations takes place. Based on these ideas, Averianov described Aharata School as a new Russian martial art. It is, therefore, not a reproduction of Asian martial arts, but an independent system that uses similar methods. This argument allowed Averianov to justify the fact that his teachings were often different from original Asian sources and practices. According to Averianov, humans are spiritual beings of cosmic origins. They were created artificially by Tarrjans, advanced humanoids from a nearby galaxy. Sixty five million years ago unisexual Amazons-Tarrjans killed all dinosaurs on Earth and brought here classic Abominable Snowmen from the Constellation Virgo as a biobase for acclimatization. First ‘Solar’ humanoids, however, were created on Venus, in its magnetic fields, and later moved to Earth. Here they crossbred mostly with yeti, but also with simple animals (Var Avera 2003:35). From that crossbreeding emerged all sorts of mythological creatures, such as sphynxes and centaurs, and at some point this hybridization eventually produced the most developed hybrid, (i.e. the modern human). Humankind is, therefore, a part of larger cosmic processes that affect multiple galaxies. Earth is involved in large-scale developments of the universe in which two adversarial races of aliens play a pivotal role. The first one are Tarrjans. They are associated with Venus, constellations Orion and Virgo, and their home galaxy Ingalatria. The other alien race is associated with Mars and Sirius. On Earth, these two races established their spiritual centers. Influence of Venus and Orion is concentrated in Tibet and represented in Buddhism and Taoism, while influences of Mars and Sirius express themselves through Judaism (Var Avera 2003:36); the latter seems to be also associated with Freemasonry (Var Avera 2003:34). Humanity, according to Averianov, should not join any of these cosmic powers, because both are foreign to Earth and Solar System and therefore cannot fully integrate into local spiritual structures. Instead, humanity should create its own methods of development and achieve spiritual independence. Aharata School claims to inaugurate this process. Similar to many contemporary esoteric doctrines, Averianov adopted a doctrine of subtle bodies inspired by theosophical literature. To describe a structure of subtle bodies, Averianov coined a word “Aharata” that gave the name to the entire school. According to Averianov, Aharata is “the axial energy channel that connects the top of the head with perineum and spread below and above a body” (Averianov 2003:41). Several centers of energy are located on Aharata. These centers Averianov calls “chakras.” According to him, there are more than fifteen chakras in a human subtle body, and over time the number of chakras increases as humankind discovers new spiritual realms (Averianov 2003:37). Averianov describes Aharata in a way that assumes that an adept of astral karate can use it to achieve higher levels of existence. He depicts the universe as a hierarchy of layers that includes Sun, our Galaxy (called Oril’na), Meta-Galaxy (Buagiria), “Meta-Galaxy in thirty six temporal dimensions” (Brahmolokia), and, finally, “the world of the Uncreated First Cause” (Pralaitsaria) where a person can contact the Absolute, or Maheshvara (Averianov 2003:42). Connection with these higher levels of existence is the key to certain advanced practices of Aharata School. The central practical element of astral karate is a control over sansa, spiritual energy that presumably allows one to influence others, to cure illnesses, to ensure prosperity, etc. It is worthwhile to stress, however, that Averianov describes the goals of Aharata School as global rather than personal. Although a practitioner can achieve personal goals using sansa, Averianov claims that he created the movement to help the evolution of humanity as a whole and to introduce more sustainable modes of development of human potential. Exercises promoted by Averianov are similar to yoga and qigong. They usually include certain movements or postures, breathing techniques, and visualizations. Exercises are combined in sequences called “katas,” a term derived from Japanese martial arts. There are two types of katas in astral karate, small and large. Small katas consist of a short series of exercises or even one move that is performed several times. For instance, “Kata of Breath” includes of five simple breathing exercises (Averianov 2003:21-23). Each large kata consists of twelve elements. For example, “Carpet Kata” is a series of twelve Hatha yoga postures accompanied by visualization of energies floating through the body (Averianov 2003:68-73), while “Tantric Kata” is a set of twelve sexual positions involving a male and a female practitioner who should perform it with mantras and visualizations (Averianov 2003:76-84). “Tantric Kata” was especially provocative in a context of restrictive Soviet sexual morality. Despite of overall liberalization of Soviet culture in the second half of 1980s, numerous suppressions and restrictions surrounded discussions about sexuality. In these circumstances, critics cited instructions on “Tantric Kata” as a proof of amorality of the movement. At the same time, these practices were inherently attractive for prospective students, because they involved culturally suppressed human desires. Beyond katas designed primarily for training and spiritual development, Averianov described certain techniques for specific practical goals, such as healing. A healing session in Aharata School can be performed as a meditation and includes the following steps. First, an adept of Aharata School by means of imagination identifies his or her astral body with the astral body of a patient. After that, the adept moves to higher levels of being to contact with the Absolute. When this is accomplished, the adept should return to Earth and contact “egregor of Neanderthals” that allows the adept to influence processes in physical reality. At the next step, the adept connects his or her chakras with different planets to transmit their energies. Especially important is Mercury, which allows connecting the “Solar-Galactic astro-brain” that was created by intelligent dinosaurs. Finally, the adept contacts the “proto-monad chakra” located slightly below the top of a head, and uses the power of the monad to launch the process of self-healing in a patient that will be performed by a patient’s “monad” (Averianov 2003:42-43). The description above provides a general understanding of a practical side of astral karate. Although this example is very specific, similar practices exist in astral karate for various other purposes. The original Aharata School [Image at right] was a loosely organized community of Averianov’s students with different interests. It remains unclear, how many people are involved in the school currently. However, among public esoteric figures in Russia, Anton Poddubny and Herman Minkin are affiliated with Averianov and the original Aharata School. They develop Averianov’s ideas and might be considered his spiritual disciples. Several years ago Poddubny and Minkin created their own spiritual communities that promote ideas of Aharata School. A number of movements, mostly in Russia and Ukraine, integrated ideas of astral karate into their teachings. The most prominent of them was “Ashram of Shambhala,” created by Constantine Rudnev in 1989. The movement was popular in Russia during the 1990s and 2000s until Rudnev’s arrest in 2010 followed by a ban of the group. At the apex of its popularity, Ashram of Shambhala attracted thousands of followers from all regions of Russia. Although Averianov himself was not involved in activities of this group, it used many ideas from his publications. Rudnev claimed in his lectures that the Aharata School was created centuries ago by a Hindu deity Shiva and that “guru Var Avera” was a Shiva’s present-day avatar (Astrokarate 2018). Another person who promoted Aharata School was a Ukrainian karate instructor Sergei Tsvelev, also known under his spiritual name Oris. 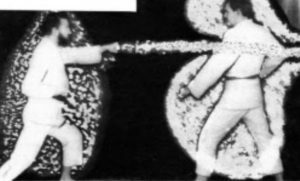 In his three-volume book Put’ Karate (The Way of Karate), Tsvelev dedicated the third volume to development of psychic abilities such as seeing auras and self-defense [Image at right] by means of psychic energies. These chapters of the book directly referenced Averianov’s ideas and practices (e.g., Tsvelev 1992:164). In the years following, Tsvelev developed his own spiritual teaching that he calls Iissiidiology. The movement has no institutionalized structure. It exists as a network of communities, more or less connected with the original school and each other. Some of them prefer to distance themselves from Valery Averianov. There is, therefore, no mechanism to ensure a sustainability of the movement; this might lead to its further fragmentation and disappearance after the death of its creator. Valery Averianov himself, as many other esoteric leaders, is an ambiguous figure. One of the issues, related to his biography, is an extensive and sometimes ethically questionable promotion of sexual practices. Another issue is Averianov’s limited knowledge of traditional martial arts and spiritual practices. Ethical controversies and criticism from conventional martial arts instructors who think that Averianov and his followers abuse a word “karate” pose a serious problem for the movement and affect its reputation. The Aharata School has been, in many respects, a product of its time. It formed in very peculiar circumstances of the late-Soviet period and reflected certain tendencies characteristic of that period. It was definitely attractive during the turbulent time of Perestroika and post-Soviet 1990s. However, in changing social circumstances, it remains unclear whether the movement will be able to adapt and develop viable strategies for further growth. Image #3: Aharata School logo. Astrokarate. 2018. Accessed from https://www.youtube.com/watch?v=ZYPgim3zzTg on 15 February 2019. Kungurtsev, Igor, and Olga Luchakova. 1996. “Pagan Sorcery, Christian Yoga, and Other Esoteric Practices in the Former Soviet Union.” International Journal of Transpersonal Studies 13:21-29. Menzel, Birgit. 2012. “Occult and Esoteric Movements in Russia from the 1960s to the 1980s.” Pp. 151-85 in The New Age of Russia, edited by Birgit Menzel, Michael Hagemeister, and Bernice Glatzer Rosenthal. Munich: Verlag Otto Sagner. Panin, Stanislav. 2017. “Astral Karate as a Phenomenon of Late-Soviet Esoteric Underground.” Open Theology 3:408-16. 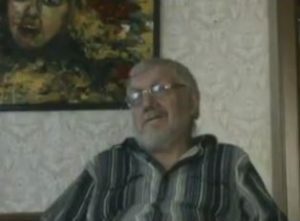 Tsvelev, Sergei. 1992. Put’ Karate. Volume 3. Moscow: Kobriz. Var Avera. Astral’noye Karate. 2009. Shkola Russkikh Masonov. Accessed from https://www.youtube.com/watch?v=UyO0X8tvucw on 11February 2019. Var Avera. 2003. Astral’noye Karate. Kyiv: Sport-press. Var Avera. 1974. Azbuka Russkoi Iogi. Accessed from http://www.pralaya.ru/index.php?option=com_content&task=view&id=51&Itemid=12 on 11 February 2019.